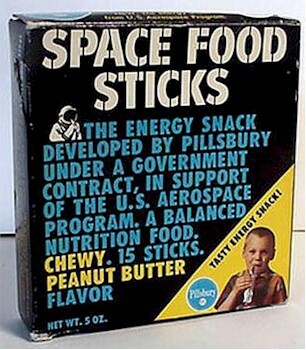 My mom got me these for my elementary school lunches for a couple of years. The last year I gave almost all of them away to a friend who's family was having a rough patch. I'm also from West Michigan. Small town north of Grand Rapids: Comstock Park. I'm from Michigan as well and definitely remember eating these. Grew up in Western Michigan and definitely ate these. I remember the commercials showing the astronauts shoving them through a little hole in the clear face shield of their helmets...they had that handy "rod" shape. Now I eat PowerBars before/during cycling...updated version of SFS better tasting and more expensive! I grew up in Pennsylvania. I didn't care much for the peanut butter, but the chocolate-oh boy! I do not recall these at all. I wonder if they were only in certain location. I lived in mid-California. Two who knows these, where did you grow up? I'd forgotten all about these--I remember liking them.